The Nintendo Switch has received its fair share of brand new experiences from Nintendo over the past year but it has also seen a number of Wii U gems get the chance to make a comeback too. Mario Kart 8 Deluxe, Pokkén Tournament DX and both Bayonetta titles have all made the transition over with new bells and whistles attached and next up on Nintendo’s Wii U tour is Retro Studio’s 2D platformer Donkey Kong Country: Tropical Freeze. 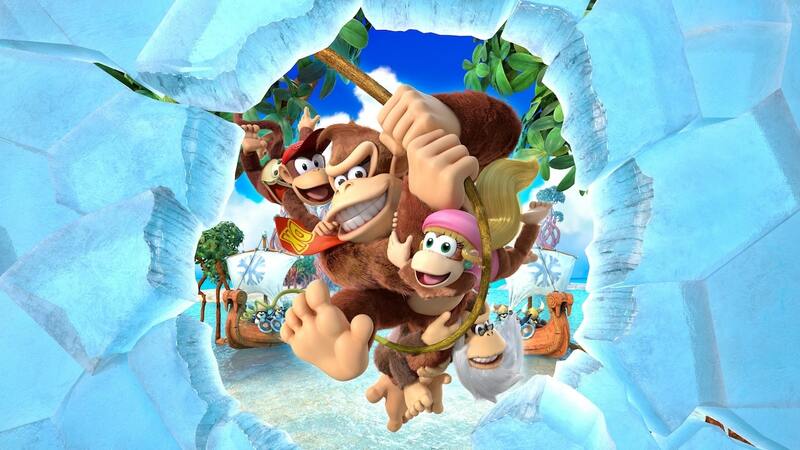 Story-wise, Donkey Kong Country: Tropical Freeze keeps things light. An army of Viking-themed arctic animals called Snowmads interrupt Donkey Kong’s birthday (perhaps the worse offence any villain could commit), cover Donkey Kong Island in snow and ice and then expel the furry group off the island using a powerful gust of wind. It’s now up to Donkey, Diddy, Dixie and Cranky Kong (or Funky, but more on him later) to make their way back to Donkey Kong Island and reclaim their home. A sequel to Donkey Kong Country Returns on the Wii, which in itself was a reboot of the original series on the SNES, Donkey Kong Country: Tropical Freeze doesn’t try to reinvent what we know the franchise to be. Instead, it aims to perfect upon it. And perfect it does. The game is constantly surprising and engaging, with every new island not only offering a new environmental theme but also a whole batch of fresh ideas. You might be swimming for your life from a giant squid, racing through a factory bouncing on cubes of jelly, taking down a trio of baboon bosses or leaping through a perilous temple as its platforms sink into lava. Each and every stage you face has been polished and tweaked to such a high degree that no platform or enemy will every feel aimlessly placed. Everything has been planned to perfection. It’s because of this excellent level design that Retro Studios is able to craft some of the toughest platforming challenges out there that rarely frustrate and always pays off on completion. All of the series trademarks remain – forward rolls, cartwheels, swinging vines, bonus rooms, Rambi the Rhino and coloured balloons to name a few. Each level is also stocked with collectables to search and find – the letters K, O, N and G along with puzzle pieces, coins and, of course, bananas tucked away in some truly devious places. The now infamous mine cart stages also make a return along with the precision based barrel-blasting moments. Even the rocket barrel stages from Donkey Kong Country Returns make an appearance too. While Donkey Kong may be the star of the show, you’ll also be able to team up with Diddy, Dixie and Cranky. This not only doubles your health count but, more importantly, allows you to use their unique abilities. Let’s face it, besides his strength and mean roll, the big ape could use a helping hand. Diddy’s rocket pack and Dixie’s long hair both aid your jumping but it is Cranky’s talent that’s perhaps the most interesting in offering a Ducktales-esque cane hop that allows the pair to traverse spiky areas unharmed. When playing alone your teammate will climb on the back of Donkey Kong the whole time while playing two-player will separate the pair with one person controlling each. Both are great options and even using a Joy-Con on its side, while not perfect, worked just fine for us. So what’s new in this updated Switch version? Smaller things like load times are shorter throughout whether it’s the initial load of the game or transitioning from the world map to a level. The framerate might chug a little during these loading screens but runs without any trouble during gameplay. Visually the game looks almost identical to its four-year-old counterpart running at a 1080p resolution in docked and 720p in handheld mode. Despite little change though it still impresses, sporting a vast array of bright colours and creative environments that take you from lush jungles to snowy peaks and everywhere in between. Of course, the biggest new addition is that of playable character Funky Kong. When you first start a fresh save file, you’re faced with one of two options. You can either play the game in its original form – tough difficulty and all – or opt for the easier “Funky Mode”. The sunglasses-wearing surfer is only playable in this latter option and brings with him a wealth of handy abilities the other Kongs do not. Funky can take five hits as opposed to the two the rest of the cast can handle, he can roll indefinitely, breath underwater forever, double jump, hover gently after a jump and even use his surfboard to protect him from spiky floors. All of these abilities definitely help combat the game’s tougher difficulty but it’s not a guaranteed lifesaver. A mistimed blast from a barrel will still result in instant death and bottomless pits while certainly easier to traverse are still very much a threat even with Funky’s hover and double jump. Should you find things a little too easy, the game allows you to switch back to Donkey Kong who along with Diddy, Dixie and Cranky will also benefit from an extra heart added to their health bar. As a helpline for less seasoned players, “Funky Mode” does a decent job. It’s less demanding without making things too easy. As someone who not only played the Wii U version but also welcomes a challenge though, I found myself trying out Funky Kong for a few stages before hopping back to the original experience. I didn’t want the extra hearts nor the hover. I wanted to take down the Snowmads without the assistance even if it meant struggling. I wanted to feel that sense of accomplishment you get from a platformer after numerous failed attempts. I get it, “Funky Mode” isn’t aimed at someone like myself, but when it’s your biggest and only real new addition to the game, you can’t help but feel a little disappointed. The original SNES trilogy of games are famed for their exceptional soundtracks and while Donkey Kong Country Returns failed to match the same level of quality set out by its predecessors, Donkey Kong Country: Tropical Freeze stands proudly beside them delivering arguably some of the best tracks the series has seen (or in this case heard) to date. A big reason for this comes down to the return of former Rare composer David Wise who manages to create music for the game that feels both familiar but also fresh. To merely pinpoint individual highlights would be doing a disservice to the consistency of quality on display in Donkey Kong Country: Tropical Freeze – whether it’s original pieces or remixes on the series’ classics. It’s a tough job finding any major faults with my time spent playing Donkey Kong Country: Tropical Freeze, the level of quality is high across the board. Sure, there could be a little more variety in the bonus stages and the rocket barrel portions of the game still feel a little too trial-and-error-focused but these are small issues in an otherwise brilliant product. If there’s one area I feel the game does suffer, it’s in what’s actually been added. While other Nintendo published Wii U games that have made or will be making the leap over to Switch have featured some form of additional content in them, Donkey Kong Country: Tropical Freeze feels by far the slimmest offering of the bunch. Mario Kart 8 Deluxe included all its downloadable content as well as a new and improved battle mode, while upcoming releases Captain Toad: Treasure Tracker and Hyrule Warriors: Definitive Edition also appear to be trying to add incentive for those who may want to double-dip. As a result of its minimal new content, Donkey Kong Country: Tropical Freeze is a tougher sell for those who experienced the Wii U original. It’s a shame because a new island or even a character not so heavily aimed at less skilled players would have helped make more of a case to this group. Donkey Kong Country: Tropical Freeze was and still is a fantastic 2D platformer. It looks and sounds brilliant and plays just as well, constantly surprising you with new and creative ideas throughout its six-island quest. This may have been my second time playing through the Retro Studios platformer but I enjoyed every moment despite a disappointing lack of new content. And if you never got the chance to check out the big ape’s icy adventure back on Wii U then this Switch version is an absolute must. Inaccurate regarding 720p in handheld, sadly.